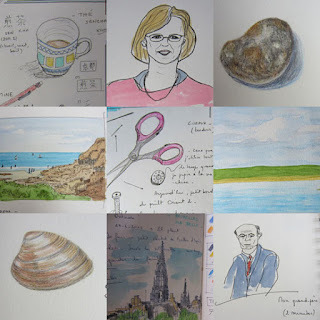 I am taking an online class at Sketchbook Skool. I think I needed a little break from sewing and quilting. My goal is to draw every day again. The "Orient" quilts are finished. My sewing machine is now at the doctor's for a check-up. I should get it back in a few days. In other news, as you know, there is a lot of soccer games on tv these days. So, there is also plenty of time in the evening for drawing and reading. I only watch the games of the Belgian team. I love your sketch mosaic your pages are very expressive and lively, our inner critics are forever vigilant, mine is always interfering! I have been sketching every day for 5 years now and I love doing it, I find it very calming and relaxing. 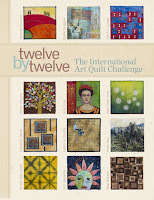 Your quilts look beautiful, looking forward to seeing some closeups. That looks like fun to branch off in another direction and polish your sketching skill with a class. I've always admire people who can sketch and paint. Your soccer games sound like fun to watch. We've been watching the Olympic try outs and there have been a couple of athletes from Boise trying to get to the Olympics.